Michaelis–Menten saturation curve for an enzyme reaction showing the relation between the substrate concentration and reaction rate. This equation is called the Michaelis–Menten equation. Here, represents the maximum rate achieved by the system, at saturating substrate concentration. The Michaelis constant is the substrate concentration at which the reaction rate is half of . Biochemical reactions involving a single substrate are often assumed to follow Michaelis–Menten kinetics, without regard to the model's underlying assumptions. 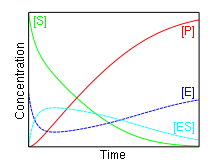 where (forward rate), (reverse rate), and (catalytic rate) denote the rate constants, the double arrows between S (substrate) and ES (enzyme-substrate complex) represent the fact that enzyme-substrate binding is a reversible process, and the single forward arrow represents the formation of P (product). The reaction order depends on the relative size of the two terms in the denominator. At low substrate concentration so that Under these conditions the reaction rate varies linearly with substrate concentration (first-order kinetics). However at higher with , the reaction becomes independent of (zero-order kinetics) and asymptotically approaches its maximum rate , where is the initial enzyme concentration. This rate is attained when all enzyme is bound to substrate. , the turnover number, is the maximum number of substrate molecules converted to product per enzyme molecule per second. Further addition of substrate does not increase the rate which is said to be saturated. The Michaelis constant is the at which the reaction rate is at half-maximum, and is an inverse measure of the substrate's affinity for the enzyme—as a small indicates high affinity, meaning that the rate will approach with lower than those reactions with a larger . The value of is dependent on both the enzyme and the substrate, as well as conditions such as temperature and pH. The model is used in a variety of biochemical situations other than enzyme-substrate interaction, including antigen-antibody binding, DNA-DNA hybridization, and protein-protein interaction. It can be used to characterise a generic biochemical reaction, in the same way that the Langmuir equation can be used to model generic adsorption of biomolecular species. When an empirical equation of this form is applied to microbial growth, it is sometimes called a Monod equation. The constant (catalytic efficiency) is a measure of how efficiently an enzyme converts a substrate into product. Diffusion limited enzymes, such as fumarase, work at the theoretical upper limit of 108 – 1010 /M*s, limited by diffusion of substrate into the active site. Michaelis–Menten kinetics have also been applied to a variety of spheres outside of biochemical reactions, including alveolar clearance of dusts, the richness of species pools, clearance of blood alcohol, the photosynthesis-irradiance relationship, and bacterial phage infection. In this mechanism, the enzyme E is a catalyst, which only facilitates the reaction, so that its total concentration, free plus combined, is a constant. This conservation law can also be observed by adding the first and third equations above. where is the maximum reaction velocity. The first step in the derivation applies the law of mass action, which is reliant on free diffusion. However, in the environment of a living cell where there is a high concentration of proteins, the cytoplasm often behaves more like a gel than a liquid, limiting molecular movements and altering reaction rates. Although the law of mass action can be valid in heterogeneous environments, it is more appropriate to model the cytoplasm as a fractal, in order to capture its limited-mobility kinetics. Thus it holds if the enzyme concentration is much less than the substrate concentration. Even if this is not satisfied, the approximation is valid if is large. In both the Michaelis–Menten and Briggs–Haldane analyses, the quality of the approximation improves as decreases. However, in model building, Michaelis–Menten kinetics are often invoked without regard to the underlying assumptions. This is true under standard in vitro assay conditions, and is true for many in vivo biological reactions, particularly where the product is continually removed by a subsequent reaction. In situations where neither of these two conditions hold (that is, the reaction is low energy and a substantial pool of product(s) exists), the Michaelis–Menten equation breaks down, and more complex modelling approaches explicitly taking the forward and reverse reactions into account must be taken to understand the enzyme biology. The typical method for determining the constants and involves running a series of enzyme assays at varying substrate concentrations , and measuring the initial reaction rate . 'Initial' here is taken to mean that the reaction rate is measured after a relatively short time period, during which it is assumed that the enzyme-substrate complex has formed, but that the substrate concentration held approximately constant, and so the equilibrium or quasi-steady-state approximation remain valid. By plotting reaction rate against concentration, and using nonlinear regression of the Michaelis–Menten equation, the parameters may be obtained. Before computing facilities to perform nonlinear regression became available, graphical methods involving linearisation of the equation were used. A number of these were proposed, including the Eadie–Hofstee diagram, Hanes–Woolf plot and Lineweaver–Burk plot; of these, the Hanes–Woolf plot is the most accurate. However, while useful for visualization, all three methods distort the error structure of the data and are inferior to nonlinear regression. Nonetheless, their use can still be found in modern literature. The above equation has been used to estimate and from time course data. The Michaelis-Menten equation has been used to predict the rate of product formation in enzymatic reactions for more than a century. Specifically, it states that the rate of an enzymatic reaction will increase as substrate concentration increases, and that increased unbinding of enzyme-substrate complexes will decrease the reaction rate. While the first prediction is well established, the second has never been tested experimentally. To determine whether an increased rate of unbinding does in fact decrease the reaction rate, Shlomi Reuveni et al. mathematically analyzed the effect of enzyme-substrate unbinding on enzymatic reactions at the single-molecule level. According to the study, unbinding of an enzyme from a substrate can reduce the rate of product formation under some conditions, but may also have the opposite effect. As substrate concentrations increase, a tipping point can be reached where an increase in the unbinding rate results in an increase, rather than a decrease, of the reaction rate. The results indicate that enzymatic reactions can behave in ways that violate the classical Michaelis-Menten equation, and that the role of unbinding in enzymatic catalysis still remains to be determined experimentally. ↑ "Victor Henri". Whonamedit?. Retrieved 24 May 2011. 1 2 Chen, W.W.; Neipel, M.; Sorger, P.K. (2010). "Classic and contemporary approaches to modeling biochemical reactions". Genes Dev. 24 (17): 1861–1875. doi:10.1101/gad.1945410. PMC 2932968 . PMID 20810646. 1 2 Lehninger, A.L. ; Nelson, D.L. ; Cox, M.M. (2005). Lehninger principles of biochemistry. New York: W.H. Freeman. ISBN 978-0-7167-4339-2. 1 2 Chakraborty, S. (23 Dec 2009). Microfluidics and Microfabrication (1 ed.). Springer. ISBN 978-1-4419-1542-9. ↑ Mathews, C.K. ; van Holde, K.E. ; Ahern, K.G. (10 Dec 1999). Biochemistry (3 ed.). Prentice Hall. ISBN 978-0-8053-3066-3. ↑ Stroppolo, M.E. ; Falconi, M.; Caccuri, A.M.; Desideri, A. (Sep 2001). "Superefficient enzymes". Cell Mol Life Sci. 58 (10): 1451–60. doi:10.1007/PL00000788. PMID 11693526. ↑ Yu, R.C. ; Rappaport, S.M. (1997). "A lung retention model based on Michaelis–Menten-like kinetics". Environ Health Perspect. 105 (5): 496–503. doi:10.1289/ehp.97105496. PMC 1469867 . PMID 9222134. ↑ Keating, K.A. ; Quinn, J.F. (1998). "Estimating species richness: the Michaelis–Menten model revisited". Oikos. 81 (2): 411–416. doi:10.2307/3547060. JSTOR 3547060. ↑ Jones, A.W. (2010). "Evidence-based survey of the elimination rates of ethanol from blood with applications in forensic casework". Forensic Sci Int. 200 (1–3): 1–20. doi:10.1016/j.forsciint.2010.02.021. PMID 20304569. ↑ Abedon, S.T. (2009). "Kinetics of phage-mediated biocontrol of bacteria". Foodborne Pathog Dis. 6 (7): 807–15. doi:10.1089/fpd.2008.0242. PMID 19459758. 1 2 3 Murray, J.D. (2002). Mathematical Biology: I. An Introduction (3 ed.). Springer. ISBN 978-0-387-95223-9. 1 2 3 4 5 6 7 8 Keener, J.; Sneyd, J. (2008). Mathematical Physiology: I: Cellular Physiology (2 ed.). Springer. ISBN 978-0-387-75846-6. ↑ Briggs, G.E. ; Haldane, J.B.S. (1925). "A note on the kinematics of enzyme action". Biochem J. 19 (2): 338–339. doi:10.1042/bj0190338. PMC 1259181 . PMID 16743508. ↑ Zhou, H.X. ; Rivas, G.; Minton, A.P. (2008). "Macromolecular crowding and confinement: biochemical, biophysical, and potential physiological consequences". Annu Rev Biophys. 37 (1): 375–97. doi:10.1146/annurev.biophys.37.032807.125817. PMC 2826134 . PMID 18573087. ↑ Grima, R.; Schnell, S. (Oct 2006). "A systematic investigation of the rate laws valid in intracellular environments". Biophys Chem. 124 (1): 1–10. doi:10.1016/j.bpc.2006.04.019. PMID 16781049. ↑ Schnell, S.; Turner, T.E. (2004). "Reaction kinetics in intracellular environments with macromolecular crowding: simulations and rate laws". Prog Biophys Mol Biol. 85 (2–3): 235–60. doi:10.1016/j.pbiomolbio.2004.01.012. PMID 15142746. 1 2 Segel, L.A.; Slemrod, M. (1989). "The quasi-steady-state assumption: A case study in perturbation". Thermochim Acta. 31 (3): 446–477. doi:10.1137/1031091. 1 2 Leskovac, V. (2003). Comprehensive enzyme kinetics. New York: Kluwer Academic/Plenum Pub. ISBN 978-0-306-46712-7. ↑ Greco, W.R.; Hakala, M.T. (1979). "Evaluation of methods for estimating the dissociation constant of tight binding enzyme inhibitors,". J Biol Chem. 254 (23): 12104–12109. PMID 500698. ↑ Hayakawa, K.; Guo, L.; Terentyeva, E.A. ; Li, X.K. ; Kimura, H.; Hirano, M.; Yoshikawa, K.; Nagamine, T.; et al. (2006). "Determination of specific activities and kinetic constants of biotinidase and lipoamidase in LEW rat and Lactobacillus casei (Shirota)". J Chromatogr B Analyt Technol Biomed Life Sci. 844 (2): 240–50. doi:10.1016/j.jchromb.2006.07.006. PMID 16876490. ↑ Schnell, S.; Mendoza, C. (1997). "A closed form solution for time-dependent enzyme kinetics". Journal of Theoretical Biology. 187 (2): 207–212. doi:10.1006/jtbi.1997.0425. ↑ Goudar, C. T.; Sonnad, J. R.; Duggleby, R. G. (1999). "Parameter estimation using a direct solution of the integrated Michaelis–Menten equation". Biochimica et Biophysica Acta (BBA) - Protein Structure and Molecular Enzymology. 1429 (2): 377–383. doi:10.1016/s0167-4838(98)00247-7. PMID 9989222. ↑ Goudar, C. T.; Harris, S. K.; McInerney, M. J.; Suflita, J. M. (2004). "Progress curve analysis for enzyme and microbial kinetic reactions using explicit solutions based on the Lambert W function". Journal of Microbiological Methods. 59 (3): 317–326. doi:10.1016/j.mimet.2004.06.013. PMID 15488275. ↑ Reuveni, Shlomi; Urbakh, Michael; Klafter, Joseph (2014). "Role of Substrate Unbinding in Michaelis-Menten Enzymatic Reactions". Proceedings of the National Academy of Sciences. 111 (12): 4391–4396. Bibcode:2014PNAS..111.4391R. doi:10.1073/pnas.1318122111.